This is a three-day course that will provide you with the necessary knowledge and skills to be qualified to scuba in more challenging dive sites around the world. You will receive a license from PADI and be able to dive to a depth of 30m with a dive buddy upon fulfilling all the course requirements. The course begins with a self-study of e-Learning materials, which you can access at home, to comprehend the vital theories of diving before proceeding to the actual diving lessons. After that, our PADI-certified instructors will help you build your confidence and develop your scuba skills through five adventure dives- three of which are compulsory dives while the other two descents can be based on your personal interests and preferences. Don’t worry about the scuba diving equipment because it’s included in the package. After posting your payment, wait for the email from PADI containing the redeem code which you can use to get started immediately. Please check your inbox as the email will be sent within 24 hours. Simply follow the link and create an account on the PADI website and log-in to acquire the Open Water Manual or Open Water Touch app which contains sections of reading materials, videos, and interactive presentations. After going through all the online review materials, you will answer a final exam and a table exam to determine if you’re ready for the next phase of the course. 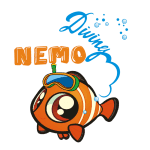 After reading the e-Learning materials, you can proceed to the thrilling highlight of the course, the adventure dives! Just get in touch with us to schedule the date and time of your dives according to your personal preference. The meeting point is at the Nemo Diving Center on the day of the dive to fill out some forms and try on your scuba equipment. When you’re done, you will be accompanied by our PADI-certified instructors to the beach of Dukes Hotel in Dubai for your five adventure dives. There will be three compulsory dives to practice Deep Dive, Navigation, and Peak Performance Buoyancy. The last remaining couple of dives will be up to you, you can select from a number of available options.